Israeli soldiers abducted, Saturday, two young Palestinian men from their homes in Hebron, in the southern part of the occupied West Bank. Media sources said dozens of soldiers invaded neighborhoods in Hebron city, before storming and violently searching several homes, and interrogated many Palestinians while inspecting their ID cards. 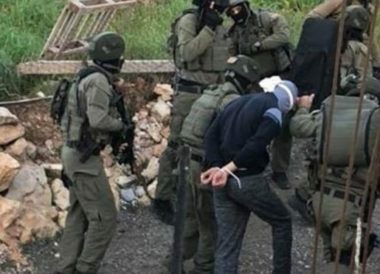 They added that the soldiers abducted Adli Adnan Gheith and Ismael Ghaleb Ja’bari, before taking them to a military base near Hebron. On Saturday evening, the soldiers invaded many neighborhoods in Hebron, and assaulted two Palestinians from the southern area of the city. The army also installed roadblocks on main roads leading to Sa’ir and Halhoul towns, north of Hebron, before stopping and searching dozens of cars, and interrogated many Palestinians while inspecting their ID cards.